The Raptors have a patchwork group of veterans hoping to take advantage of LeBron James's move to the Lakers. In a loaded Eastern Conference, their experience is their best asset. NEW YORK — Scattered across the visitors locker room at Madison Square Garden on March 28 sat five players with an impressive haul of accolades. The quintet of veterans combined for two NBA championships, five conference titles, 11 All-Star appearances and three Defensive Player of the Year awards. So when Raptors’ fourth-year guard Norman Powell wanted some advice on how to improve his post-game routine, he had no shortage of available options. Toronto cruised past the Knicks 117–92 in their late-season matchup, relying less on its wealth of experience than potential Most Improved Player Pascal Siakam bursting past New York’s shoddy transition defense. 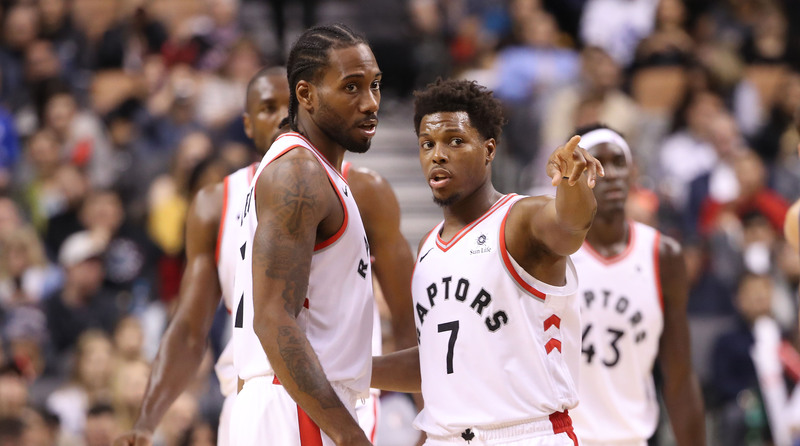 But while a March matchup against an egregious tanker provided another opportunity for the Raptors’ youngsters to shine, their veteran core will largely be responsible for any potential run to the Finals in June. In a four-way battle to steal LeBron James’s abdicated throne, Toronto’s experience may just be its greatest advantage. The Raptors are a bit of a patchwork group despite its pool of proven playoff performers. Kyle Lowry is the lone mainstay, coming north of the border in 2012. Serge Ibaka has been with Toronto since February 2017, yet he’s been tasked with an evolution in 2018-19. After spreading his game to the three-point line over the last two seasons, Ibaka has crept inside the arc this year. He’s attempting two fewer threes per 36 minutes compared to last year, jolting his percentage of shots within three feet from 16.2% in 2017-18 to 25.5% in 2018-19. After being saddled to the corner for kickout threes for much of last season, Ibaka is returning to his Oklahoma City roots, proving he’s still effective in the paint. While Ibaka has been forced to adapt within his surroundings, Toronto’s three other household veterans moved franchises within the last year. 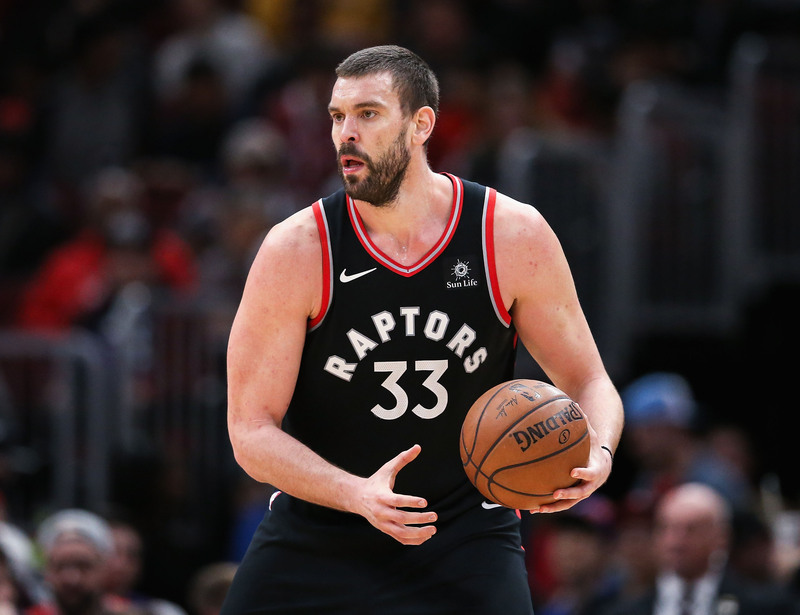 Kawhi Leonard and Danny Green are in their first season with the Raptors, and Marc Gasol came to Toronto following February’s trade deadline. What went from a duo of accomplished veterans more than doubled into a seasoned fivesome, with each veteran feeding off one another to maximize their impact. “You rely back on a lot of things you’ve experienced,” Green told The Crossover. “The failures are what you learn from the most. I learn from the experience I’ve had. And other guys, coming from other places, they help guys understand how it’s supposed to be handled, and we put our heads together and go from there. Playoff failures. They’ve become commonplace in Toronto over the last half-decade, with a string of seasons ending in late April and early May. The most recent playoff exit—coming via a James sweep—imploded Toronto’s core, as DeMar DeRozan was shipped to San Antonio for Leonard. Head coach Dwane Casey was sent packing, too, and assistant coach Nick Nurse took over as head coach. The moves didn’t signal a rebuild but rather a reset, and a rapid one at that. With Leonard’s free-agency pending, 2019 could mark Toronto’s last Finals opportunity in the near future. There’s, of course, the mental edge provided by Toronto’s veteran core, but how have the old heads actually performed this season? The results have been largely encouraging. Leonard is averaging career-highs in points and rebounds per game, with similar shooting efficiency compared to his final healthy season in San Antonio. He enters Friday night appearing in just 57 of Toronto’s 79 games, bringing “load management” a whole new meaning. The optional rest may cost Leonard an All-NBA spot, yet it’s a worthy sacrifice for a healthy postseason. We noted Ibaka’s return to form above, and Green is canning a career-best 45.2% of threes on 2.5 made triples per game. Perhaps another 2014 Finals moment is on the horizon for him. Lowry and Gasol are a tougher puzzle to solve. Toronto’s point guard has shown the most tread on his tires, dropping eight points per game from 2016-17 to this year. A dip in usage is partially culpable, but opportunity isn’t the only reason. Lowry has lost lift on his jump shot and floaters, losing separation when attempting to shake defenders before rising up for a shot. “He’s just not the same player as a couple of years ago, he’s lost some athleticism,” a Western Conference scout told The Crossover. “It’s a bit similar to Chris Paul, but [Paul] has been able to rebuild his body as he’s gotten healthier.” Lowry will still earn starting minutes in the playoffs, but expect him to operate more as a spot-up shooter than a creator and headliner moving forward in The Six. Gasol’s statistical slump has been more significant than Lowry’s. Big Spain has cratered to 9.3 points and 24.5 minutes per game in Toronto, career-lows on both fronts. A glance at his statistical profile suggests a former star unable to adjust to his new home, failing to adapt after moving from his longtime franchise. But those numbers obscure the reality. Toronto is scoring 116.3 points per 100 possessions with Gasol on the floor, sporting a plus-14.4 net rating. That’s more than five points above the league-best Bucks, who enter Friday night with a plus-9.0 net rating. Gasol ping-pongs the ball around the floor with glee, dropping dimes to a streaking Siakam or one of Toronto’s spot-up shooters. The former Grizzly feasts from the foul line, acting as a fulcrum while the Raptors sprint and screen with authority. Gasol moves the ball better than any center outside the Mile High City. Toronto likely took a sigh of relief when LeBron announced he was taking his talents to Hollywood in July. After eight years under James’s yoke, a window has been opened for team’s outside of Miami and Cleveland to seize the conference crown. But the path to Golden State doesn’t look so clear as we approach April 13. Milwaukee, Boston and Philadelphia each boast elite talent and quality supporting casts, including a potential MVP, a former Finals hero and an All-NBA center. The Raptors will likely face Joel Embiid and the Sixers in round two, then meet either the Bucks or Celtics in the Eastern Conference finals. The road to June is grueling. Yet if any roster is built to withstand the postseason many trials, it’s Toronto, now armed with Finals champions and playoff-tested veterans starving for a chance at the Larry O’Brien trophy.